It shows up so nicely against the white gravel...like it very much, TT. Does this type of rock have a name and do you have a weed suppressant material under your rocks? No, I didn't put weed suppressing membrane under this Gravel Garden because it isn't too large an area .. but I would probably do so if I were creating a bigger gravel garden.. Yes, please TT...I'd appreciate it if you can find out the name of the loose stones. What area is your gravel garden in the above photo?...you say it isn't very big. I'm hoping to have a small gravel area and looking at your photo has convinced me it would look lovely with bright planting against the colour of the rocks. ... There are more pics. of Gromit's Gravel Garden... see my previous GoY pic...1st Nov. 2010, and my GoY blog on 7th July. 2010, and pic of 8th July 2010. The area is by my long shed, and is mostly in the shade. I've just been out in the dark and stormy weather for you... to measure the shed and get the name of the stones !! Stones ~ Pink Rose .. by DecoPak, Huddersfield. Yorkshire. Looks beautiful Tt...especially against the white! TT...I think this will be the pebbles you have...(a slightly different name but they look similar).. "candy rose"
"Bloomer Gravel" ... that would be a nice name. Lol. Stunning! you are very good at combinations! i love the way stones and rocks and paving change colour under the rain. just wondering if those sharp little stones would protect my hostas from the slime beasts? i will let you know ~ thanks! I think this is the same one I've just ordered from Burncoose. Stunning!! When I discovered they love shade I had to have some for my shade garden NOW!! I love where you've put it, looks lovely. Very beautiful, I love how colorful it is and it really stands out there! Hi TT....Lovely dark leaves with the pink against them. Glad you have found a new site away from the marauders. All the critters lurking to chomp at plants and make mischief in the garden. I suppose the grit must tickle their tummies TT and they are not amused. Very pretty little plant! I love the dark ruby-colored leaves! ... in quite a shady area..
oh, that's lovely! how come I missed it before?? googled "plant blak ruby" ane the first hit ws the people you mention, got the link now! Ruby's leaves and flowers are lovely colours. to me they look actually black, rather than so dark a blue or purple that they can be called "black". Are they truly black? The leaves are very, very dark purple, but I agree that they look black from a distance. 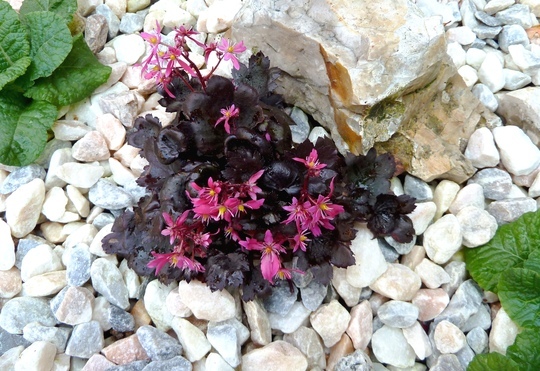 As with other plants of this type, the leaf colour varies a bit at different times of year. thanks, TT - after all, foliage colour lasts longer than flwoers! ohhhhhh! lost the leaves, or the whole plant?? mind you, one would probably lead to the other. does this "disappearance" happen often? strange ... can't be the leaf colour directly that's causing it, mist be something in the plant family tre, so to speak.